PHILADELPHIA PORT SLATED FOR ADDITIONAL DEVELOPMENT: Development of Southport Terminal is focus of Pennsylvania governor’s strategic plan. A process to enable development of Philadelphia’s Southport Terminal has been started. Pennsylvania governor has directed evaluation of Philadelphia port assets and development of a strategic plan. RFP process for development of Philadelphia’s Southport Terminal will begin by the end of December 2015. 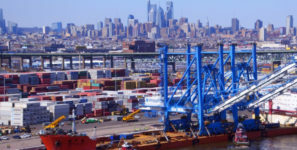 Pennsylvania Governor Tom Wolf has announced a strategic plan for sustained management, maintenance, and development of the Port of Philadelphia. The governor emphasized his key priorities of investing in infrastructure, creating jobs, and keeping Pennsylvania economically competitive. Wolf said development of the Southport Terminal is one of his main goals for the Port of Philadelphia. The 196-acre riverfront property is owned by the Philadelphia Regional Port Authority (PRPA), located immediately west of the Packer Avenue Marine Terminal. It remains idle and undeveloped, but is currently undergoing the beginnings of a process that could enable the development of Southport Terminal in 2017, creating between 590 and 3,720 new jobs, depending upon the use to which Southport is eventually put. In addition to establishing a timeline for the development of the Southport site, Wolf announced further steps his administration is taking to ensure long-term stability and growth at the Port of Philadelphia. Wolf named seven new board members to the Philadelphia Port Authority, including Chairman Sweeney and has launched a national search for a new executive director with a proven track record of successful port development. Wolf committed to creating an advisory committee of stakeholders to provide input on the future of the port. It will include stakeholders from industry, labor, local and state government to drive a unified vision for the port. Wolf has also directed the Pennsylvania Department of Transportation evaluate current port assets and develop a strategic business plan that will maximize asset utilization and employment potential and will include developing capital investment strategies. With regard to the Southport project, Wolf solicited a request for qualifications, encouraging the participation of past respondents while inviting additional private-sector interests to present their visions for the property. Requests for proposals will be sent to short-listed applicants by the end of December 2015 with an anticipated due date for the proposals by June of 2016.